This entry was posted in General, Political issues on April 25, 2016 by appleton. This entry was posted in Human Rights, Political issues on April 18, 2016 by appleton. This entry was posted in Phosphate importation, Political issues on April 17, 2016 by appleton. 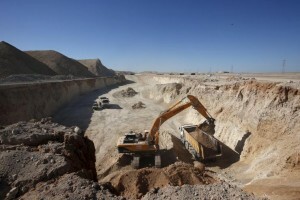 In his recent article, “Just Say No to Another Failed State,” published by Foreign Policy, Lester Munson claims that the only solution to the long standing issue between Western Sahara and Morocco is autonomy for Western Sahara under Moroccan sovereignty. Problematically, however, the article lacks context and is overly simplistic, is strewn with inaccuracies and errors, and is heavily tinged with paternalistic overtones. This entry was posted in General, Political issues on April 10, 2016 by appleton. A few weeks back UN Secretary General Ban Ki Moon described the Western Sahara as an occupied land that had been forgotten. Morocco promptly expelled UN staff from the region in protest. Stephen Zunes is the co-author of Western Sahara War, Nationalism, and Conflict Irresolution – one of the only books on the struggle by the indigenous Sahrawi people for independance. Because they are out of sight, but they shouldn’t be out of mind. Imagine you have to live in the exact same place for 40 years. And now picture that place is a settlement made of mud in the middle of the desert, surrounded only by vast stretches of dusty nothingness. That’s how the people of Western Sahara live. This entry was posted in Political issues on April 10, 2016 by appleton. Ergueibi Abdelahi was just nine months old when his aunt scooped him up and fled fighting in Western Sahara after Morocco sent troops into the former Spanish colony, leaving his parents and brother behind. Until he was 10, he thought his aunt was his mother. “She (my mother) was at the market on the day we ran,” Abdelahi says of their escape in 1978 across the border into Algeria. This entry was posted in General, Human Rights on April 10, 2016 by appleton. 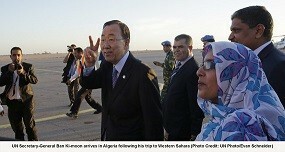 UN Secretary-General Ban Ki-moon’s first ever trip to Western Sahara has sparked a furious reaction from the Moroccan government. This entry was posted in Political issues on April 3, 2016 by appleton. “The peace process has just suffered the latest of many setbacks. 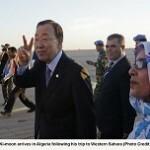 This time, Secretary-General Ban Ki-moon undertook an ill-advised visit to North Africa, which did not include Morocco, the key player in the conflict. Instead of energizing the stalled talks over Western Sahara as he intended, the secretary-general’s visit likely put them in a deep freeze until his successor takes office…. (cont.